Teams members, like Sarah Hunt, that serve as part of an OCMC Orthodox Mission Team are revived in their faith with sharing Christ with others. Please consider joining the upcoming team to Albania the departs this Spring! I never thought I would have the opportunity to go on a mission trip. So caught up in my own life, school, work, and Netflix consumed the majority of my time. As a student at Hellenic College, I am constantly surrounded by the beautiful community and Christian-centered lifestyles practiced by my fellow students. It is this community that allowed me to participate in the 2015 Spring Break mission trip to Tirana, Albania. I was taking a much-needed nap while studying for a mid-term exam when I got a text message from my friend to come to the Missions meeting that night. Precariously, I began to wake myself up and head across campus to the library building. I ended up walking into the middle of a huge meeting for the volunteer students who were going to join Project Mexico during their breaks. “Well, this is awkward,” I thought. I wasn’t signed up to go to Mexico, what did Theophani want me here for? Pulling me aside, the head of the HCHC Missions Department, Fr. Luke Veronis, asked me if I was still interested in mission work. I said yes; I’ve always admired my friends and colleagues who have sacrificed so much of their time to teaching the word of Christ. I was surprised. Why was this priest, this wonderful missionary priest, approaching me about a potential trip? BAM. He hits me with this: there had been a withdrawal from the Spring Break trip to Albania, and the people at the Project Mexico meeting had suggested my name to Fr. Luke as a replacement because they knew of my interest in getting my feet wet in mission work. A few things stood out to me immediately. Firstly, my peers were incredible, kind, and conscientious people for thinking of me at all. Secondly, I just had decided to work all of Spring Break because I had become obsessed with my new job and the way my weekly paycheck looked. Thirdly, there was no way I could turn this opportunity down. It became more and more evident to me that I had an obligation, a responsibility to accept this offer. Not because I had very much to contribute, but because I had nothing to contribute and needed this trip to refocus my priorities and values. You would think that being a student at Hellenic College-Holy Cross would motivate me to live in a Christian manner. But at that moment, between sleeping, school, work, and the next episode of Doctor Who, I was spiritually distracted. I will not say that my experience in Albania made me a better person because, frankly, I still spend most of my time doing schoolwork, thinking about a paycheck, and watching Netflix. What my trip taught me, however, was the incredible devotion and dedication that the people of mission countries have to our Lord and Savior Jesus Christ. They missionized me. 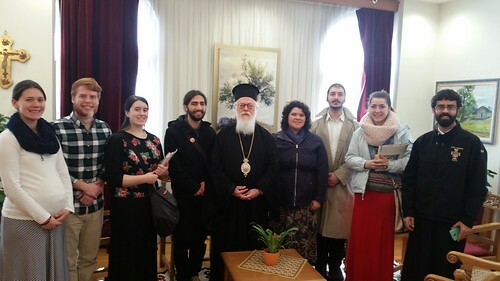 On the final day of our trip, my fellow missionaries and I assisted in running a college and high school youth conference at the Albanian Orthodox seminary in Shen Vlash. There were inspiring speakers and heart-warming small groups, but my favorite part was the singing. Albanians love to sing, and during lunch that day, our final day, our mission team sang Albanian hymns with the friends we’d made: we sang loud, we sang for the youth, we sang for God. I’ve done a lot of singing in my life; my whole family is musically involved in some way. But singing those hymns, tripping over those beautiful, tricky words was one of the best experiences of my entire life because we were singing them together. Albanians, Greeks, Bulgarians, Romanians, Americans, we were all there. And it didn’t matter what language we were singing because we were all Orthodox. An OCMC team that will be working with missionaries Dcn. Stephanos and Dkn. Alexandria Ritsi to host a conference for young adults from throughout Albania will be serving from March 19th to the 27th. Please prayerfully consider joining this team. For more information or to apply e-mail teams@ocmc.org, call 1-877-463-6784, or visit http://www.ocmc.org/about/view_team.aspx?TeamId=166.